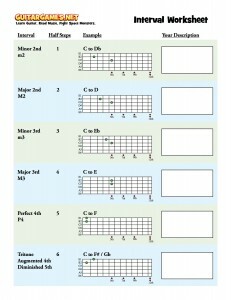 1) Play the interval on your guitar (An example of each interval is shown on the interval worksheet). Poetic: sounds harsh, sad, happy, dreamy, etc. Relate: sounds like the beginning of a song- My Bonnie, Jaws, Star Wars, etc. 3) Share: Feel free to share what you hear in the comments. Last week we had some examples from YouTube which I thought was helpful. octave (Perfect 8th) play Ear Tester using just these intervals. Can you reach 90% accuracy or above? How about with all the intervals we have covered so far? Listen for distance. Ask yourself if the notes sound close together or far apart. This will help eliminate certain choices. Next week signups for the Theory webinar will open, I hope you can make it! This entry was posted on Saturday, November 5th, 2011 at 7:45 pm	and is filed under General. You can follow any responses to this entry through the RSS 2.0 feed. You can leave a response, or trackback from your own site.